One of the greatest portrait paintings of the 17th century Dutch Baroque era, The Night Watch was executed by Rembrandt at the height of his career in Amsterdam. Originally called The Company of Frans Banning Cocq and Willem van Ruytenburch, it is a group portrait of a militia company, commissioned and paid for by the members concerned, and was intended for the Great Room of the Kloveniersdoelen (the Musketeers Assembly Hall). It was given its popular but misleading title in the late 18th-century, based on the false assumption that it depicted a nocturnal scene. In fact, its subdued lighting was caused by the premature darkening of its multi-layered varnish. The picture was a huge success at the time, not least because it turns a fairly humdrum subject into a dynamic work of art. Unlike other Baroque portraits of militia companies, which traditionally portrayed members lined up in neat rows or sitting at a banquet, Rembrandt's painting shows the company fully equipped, ready for action, and about to march. The full title of the portrait, as recorded in the family album of Captain Banning Cocq, runs: "Captain Heer van Purmerlandt (Banning Cocq) orders his lieutenant, the Heer van laerderdingen (Willem van Ruytenburch), to march the company out." Marked by Rembrandt's signature chiaroscuro and dramatic tenebrism, the work is among the most famous examples of 17th century Dutch painting. It hung in the Kloveniersdoelen in Amsterdam until 1715 when it was moved to the Town Hall; in 1808 it was transferred to the Rijksmuseum. So famous a picture, which in the past has been almost as much abused as praised, has not surpringly triggered an immense amount of analysis, only some of which can be discussed here. Known for its colossal size (roughly 12 feet x 14 feet), the canvas - when compared to earlier copies, like the version (c.1650) by Gerrit Lundens, now in the National Gallery, London - has obviously been trimmed, probably when it was moved to the Town Hall in 1715. About 60 cm, incorporating two background figures and a baby, have been removed from the left side, and lesser amounts from the other three sides. This unbalances the composition (the arch in the background was originally nearer the center) and compresses the figures into too confined a space. In all twenty-six figures are now fully or partially visible, including three children (or dwarves) and small parts of five more figures can just be discerned in the background. To the right of the arch there is a shield, added later, bearing the name of eighteen of the persons portrayed. According to two of them, who gave evidence on Rembrandt's behalf during the investigation into his financial affairs in 1658, he was paid a total of 1,600 guilders - the sitters contributed an average of 100 guilders each, the sum varying with their prominence in the picture. At least since the cleaning of the picture in 1946-7, it has been evident that the scene takes place in daylight, with the sun streaming down from the top left. A further cleaning completed in 1980 showed that the tones are predominantly cool. The traditional title The Nightwatch which dates from the late 18th century, is therefore incorrect but it would be absurdly pedantic to suggest changing it now. Demonstrating his mastery of sunlight and shade, Rembrandt leads the eye to the three key characters among the ensemble - the two officers in the centre (from whom the painting gets its original title), and the small girl in the centre left background. Behind them the company's colours are carried by the ensign, Jan Visscher Cornelissen. The senior and central officer, Captain Franz Banning Cocq (1605-55), is dressed in black with a red sash. His Lieutenant, Willem Van Ruytenburch, is in pale yellow with a white sash, and carries a ceremonial lance. The girl to the left of and behind Banning Cocq acts as a sort of pictorial mascot. She carries the guild's costly drinking horn and, at her girdle, a dead fowl, the prominent claw of which is an emblem of the Musketeers. This bird may also be intended as a pun on the Captain's name. The man in front of the girl is wearing a helmet with an oak leaf, another traditional emblem of the Musketeers or Arquebusiers. Several figures are shown handling their weapons. One pours powder down the barrel of his musket; another, to the right and behind the Lieutenant, is attending to the priming pan; a third - the small figure in a helmet directly behind Banning Cocq - appears to be firing his musket into the air. Some characters are represented much more distinctly than others, while the eighteen who subscribed are supplemented by almost as many subordinate figures, included by Rembrandt for pictorial effect. Adding these extra subjects also allowed him to make use of his broad repertoire of figure drawing and other studies. Local militia companies were raised during the 16th century during the Dutch war of Independence, to protect the cities from invasion by the Spanish army active in Flanders. But by Rembrandt's time they were no longer employed in a military capacity except on the borders, and were kept in being purely for symbolic reasons. 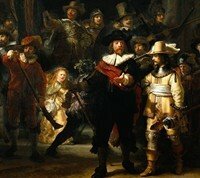 It seems that the company in Rembrandt's painting is marching out to take part in a shooting match. Various other interpretations of the picture involving illusions to past and contemporary historical events have also been put forward, but they are all now discredited. The meaning of the painting is likely to be purely that of a role portrait, the theme of which is the 'citizen in arms'. Visually, The Nightwatch tranforms the prosaic genre of militia portraiture into an action picture - a work of great movement, dazzling inventiveness and splendour or, as some 19th century critics maintained, a widely over-inflated account of a very ordinary event, or a cross between a portrait and genre painting. It marked at once a revolution in, and the swan song of, the militia company portrait, for shortly afterwards, the demand for these portraits ceased and artists turned to the quieter and more humdrum scenes of the guild portrait and the portrait of the board of hospital governors. (Compare his novel treatment of militia portraits with his treatment of 'dissection portraits' as in his famous Anatomy Lesson of Dr. Nicolaes Tulp (1632, Mauritshuis). Moreover, Rembrandt himself was never to paint such a flamboyant or such a fully Baroque picture again. However, one thing is certain; the painting was a major success at the time, and more than justified his status as one of the best portrait artists in Europe. The story that it was disliked by those portrayed and that it was the cause in the decline in Rembrandt's contemporary reputation (which did occur to some extent in the late 1640s and 1650s) is a romantic fiction invented in the 19th century. Indeed it is a wonder how this fiction arose, since there is abundant evidence to show that for more than a hundred years after it was painted, The Nightwatch was widely regarded as Rembrandt's most celebrated work. One of the greatest Dutch Realist artists, Rembrandt is famous for his penetrating and powerful portraiture, of both individuals and groups. This, together with his supreme painting skills, his atmospheric handling of light, and his mastery of chiaroscuro, make him one of the best artists of all time.  Aristotle Contemplating the Bust of Homer (1653) Metropolitan Museum, NY.  Bathsheba Holding King David's Letter (1654) Louvre, Paris.  Portrait of Jan Six (1654) The Six Foundation, Amsterdam.  The Conspiracy of Claudius Civilis (1661) National Museum, Stockholm.  The Syndics of the Cloth-Makers Guild (The Staalmeesters) (1662).  The Suicide of Lucretia (c.1666) The Minneapolis Institute of Arts.  The Jewish Bride (c.1665-8) Rijksmuseum, Amsterdam.  Return of the Prodigal Son (1668) Hermitage Museum, St Petersburg.  For more about Dutch militia company portraiture, see our main index: Homepage.